Hair transplantation can be defined as 'the permanent solution for hair loss'. A hair transplant operation can be expressed as; a microsurgical procedure that is performed in a hospital surgical setting. The concept 'microsurgical operation' implies that; a hair transplant procedure will be carried out with minimal surgical intervention unlike traditional surgery. A hair transplant operation, is an effective and permanent solution for individuals experiencing 'male-pattern baldness' which is also referred to as androgenetic alopecia. Apart from these, individuals who have scars or have lost hair due to various kinds of hair diseases can also safely undergo a hair transplant surgery. Thanks to the use of sedation given under the direct supervision of our Anesthesiologist, you will no longer feel any pain during the administration of local anesthesia prior to the hair transplant procedure. As a consequence, you will be having a more comfortable and pain-free hair transplant experience. Even though hair transplants are generally considered as painless procedures, this new method will help our patients who suffer from needle phobia, to feel at ease, allowing them to relax during the procedure. Owing to this, the level of pain that was currently at minimum is now completely eliminated. Sedation is the action of producing a state of calm or sleep under controlled sedative drug administration, monitoring the depth of sedation with the types of drugs used and the amount given tailored specifically to each patient needs. Do I Have to Receive Sedation? Sedation is efficient and safe even in young children and as we previously mentioned, it assures the patient a discomfort free hair transplant procedure with zero pain. But then again, we continue to offer hair transplant procedures without sedation for patients who do not prefer. sedation to be administered. 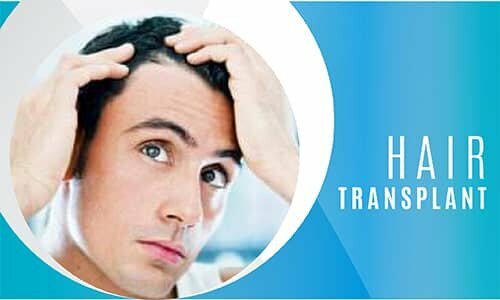 Hair transplants have come a long, long way since the early days, but it wasn't until the mid 1990's that hair transplantation started to take shape, being performed with techniques that are practised today worldwide. Hair transplants conducted with the FUT technique during the nineties, has been replaced by the FUE method which was developed in the early 2000s and introduced in 2005. Even though the technique has been in continuous development with some further refinement, the basic principles of FUE remain the same. Today, the technique continues to be regarded as the gold standard of hair transplant surgery. The most advanced technique in hair transplantation is the FUE technique. Today, people experiencing hair loss can be provided with natural looking hair with the latest modern technique FUE, the gold standard of hair restoration. The main difference of using the FUE technique for hair transplantation, is that it leaves no scars and its recovery time is shorter. The success of the operations has also increased as a consequence of the advances in medical devices utilized in the FUE technique. FUE technique can be performed with a variety of different instruments. As a consequence of this, the technique is known with a few different names. As an example, a FUE hair transplant that is performed with sapphire blades, which has been introduced recently, delivers more successful outcomes. This generally is because the incisions created by utilizing blades that are made from smooth sapphire crystals, heals faster and leaves only a barely visible scar. For men planning on undergoing a hair transplant, body hair is considered as a third source of grafts recipient. If grafts extracted from the back of the head and from the beard area are still not sufficient for coverage, among other options, chest hair can be considered as a good alternative source of hair follicles in hair transplantation. There are 2 underlying reasons why body hair is considered as the 3'rd additional donor source in hair transplantation. The first reason is; body hair grafts, particularly chest hair, have a similar structure as beard grafts; they are thick and contain one or two hairs. As for the second reason; as the anagen phase of body hair is much shorter; body hair grows shorter. This being said; hair grafts obtained from the chest cannot be used in front hair restoration. Patients have achieved natural, successful and satifactory results with 'Hair Transplantation' performed at Dr. Serkan Aygın Clinic. If you are considering a hair transplant or would like to obtain more information on hair transplantation, do not hesitate to contact us. Ensuring a significant aesthetic success during the process of harvesting the hair follicles is due to the distinctive aspect of the FUE technique. It is this innovation that has made FUE popular and preferred over FUT. The FUT technique involves removing a small strip of tissue from the back of the head and extracting the individual follicular units from this strip, whereas in FUE, each follicular unit is individually taken directly from the scalp through small circular incisions. By this way, the risk of injury is eliminated. Depending on the length of each follicular unit it is important to utilize needles that have a diameter of 0,7 mm to 0,9 mm or if the follicular unit grafts contains 3-4-5 hairs needles with a diameter of 0,1 mm should be used. The sharpness of the needles as well as being only for single-use, are the elements that have a considerable impact on the operation's success. Another important factor is to extract hair follicles with precise accuracy so as to avoid any follicular damage. For example; if the person who is having a hair transplant has very curly hair, by using a curved punch called u-graft during the process of extracting follicular units, the risk of follicular damage can be eliminated. All of these elements are refinements planned by the doctor prior to the operation, which are tailored specifically to each patient's condition. In the classic FUE technique the incisions are created by utilizing steel blades. With these slit blades, the incisions should be created with precise accuracy, considering the natural direction of hair growth. This will allow the transplanted grafts to grow out at their natural direction. While making slits in the recipient area, it is very important to follow the direction and angel of the existing hair in that region. FUE technique utilizes steel blades for creating incisions in the recipient site. During the operation, after hundreds of incisions have been created, these steel blades should be replaced with new ones. On the other hand, such a problem will not be encountered with sapphire FUE blades, because they are smoother and sharper. For each patient, according to hair follicle thickness, just a few blade tips will needed. Once again, the blades should only be used on an individual patient during a single procedure. The final stage, which is transplanting the hair follicles; is the process of transplanting the follicles one at a time at an angle of 40-45 degrees, within the incisions that have been created at directions that enables accurate placement. All three phases have certain specific technicalities and the most important technicality within all stages is certainly experience. FUE is a hair transplant technique that doesn't leave any marks or require any stitches. FUE performed with sapphire blades; a method that is regarded as the advanced version of Follicular Unit Extraction also known as FUE technique, is conducted at Dr. Serkan Aygın Clinic. Individuals aged between 20 and 60 years can undergo a hair transplant surgery. The patient who will undergo a hair transplant surgery will only need 3 days for pre-operative preperation and for recovering. Although the duration of surgery varies according to the number of grafts that will be transplanted, it usually lasts about 6 to 8 hours. In order to respond to possible complications, the operation must be conducted in a fully-equipped hospital. A hair transplant procedure is performed with a doctor and at least 3 medical technicians. It may take around 6 to 18 months to see the final outcome of hair growth. Starting from the day following the operation, the patient can expect to see hair growth until the 18'th month. 1. Consultation: This is the stage where the doctor develops the patient's operation plan and creates the hairline design. 2. 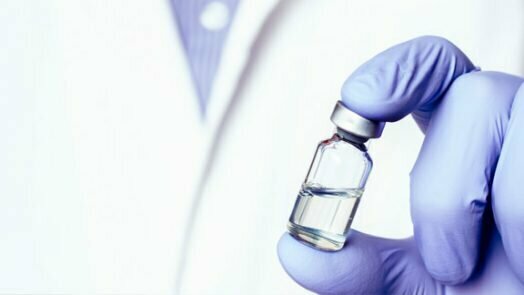 Preparation: This stage incorporates the processes of sterilizing the operation site and the application of local anesthetics. 3. Extraction: The process of extracting hair grafts from the donor area of the patient. 4. Recipient Site Creation: This is the process of creating recipient sites by following the direction of the existing terminal hairs. 5. Transplantation: This is the process of placing the grafts in recipient sites at right angles to hair direction. 6. Postoperative Processes: This stage incorporates the processes of wound-dressing for the transplanted site and PRP Therapy to speed up the healing process of the operation site. 7. Postoperative Care & Hair Wash: This is the washing process that is to be carried out for 15 days. Both the donor and the transplanted area will be sensitive during this period, so it important to carry out the washing process with extra care. Hair Transplantation with Laser Hair Therapy, is the application of low-level laser therapy also known as cold laser with hair transplantation. The main objective of applying low level laser therapy after hair transplantation is to speed up the healing time, to help reduce side effects such as redness, swelling as well as pain within the operated area and to promote the fastest hair growth possible. 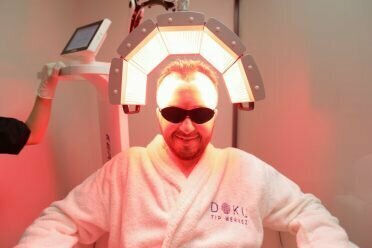 As this laser application which is performed after a hair transplant procedure allows to penetrate without heat, it has no side effects such as a burning sensation. In individuals who have undergone hair transplantation, laser therapy helps reduce the recovery time and also provides good pain control, which is linked to better wound healing. For treating hair loss conditions, we use a different low level laser device. When it is applied on the scalp twice a week for 20 minutes and twice a week, primarily the progression of hair loss stops and with long-term use it is found to have a promoting effect on hair growth. After a certain improvement level is reached, it is possible to sustain the improvements obtained by reducing to one session carried out in a week. At Dr. Serkan Aygin Clinic we apply low-level laser therapy. Laser hair therapy is a clinically proven, effective treatment for men and women who have mild to moderate hereditary pattern hair loss. Laser hair therapy increases the production of adenosine triphosphate (ATP), which induces the release of nitric oxide. This in turn leads to enhanced hair growth. Additionally, it has been also observed that laser therapy was capable of reducing scalp tissue DHT, which may help slow, or even stop hair loss and improve hair growth. Laser hair therapy that uses medical-grade lasers delivers low level laser light to the scalp. Laser therapy stimulates the hair follicles simply by increasing the blood flow to both the hair follicles and the surrounding scalp. Through this treatment you can reverse hair thinning and stimulate the natural growth cycle of hair. The result is increased hair volume and improved hair health. Laser hair therapy is a treatment that has been approved by the FDA. Moreover, there are various scientific studies that have proven the effectiveness of low-level laser therapy. The low level laser therapy device that we use at our clinic consists of 5 modules, with each transmitting energy from 364 sources. Our application that possesses 6 different therapeutic frequencies, can be specially adapted to the individual needs of our patients’. Hair transplantation can result in a more natural-looking and denser appearance. It is a permanent solution for treating moderate to severe hair loss. It is a comfortable technique that is designed to ensure patients with the least amount of discomfort, leaving no external scars after the procedure. FUE hair transplant technique offers patients faster recovery times; They can conveniently return to their daily routine and are able to travel one day after the procedure. With the right operation plan, no damage will be caused in the donor area and no change in the appearance even after multiple operations. 98% of the transplanted grafts will grow as normal hair. Dr.Serkan Aygın Clinic is a renowned hair transplantation clinic in Turkey that performs hair transplant procedures and offers hair loss treatments for patients from all around the world. For 22 years, Dr. Serkan Aygın and his operating staff have only been performing hair transplant procedures and offering hair loss treatments. The outstanding features of the doctor as well as the clinic rely on; The high level of specialisation and expertise in the field of hair restoration, attending international conferences both as a lecturer and a participant and performing hair transplant procedures for people coming from more than 50 different countries. What are the Key points of Success With FUE? 22 years of experience of performing hair transplant procedures for thousands of patients, has given us an extensive knowledge of understanding our patients’ needs. Experience helps us to correctly identify patients and ensure they are booked in for the right procedure and to find the best practice of FUE. Hair transplant operations must only be conducted by specialized doctors. People may have different health situations and hair loss conditions; a specialized doctor can examine and make the correct diagnosis. As a Dermatologist, Dr. Serkan Aygın can determine a patient’s suitability for the operation, taking into account their different hair loss conditions and provide them with all the detailed instructions on what should be done or avoided prior, during and after the operation. A specialist will care about their patients’ health, not only the final outcome of their hair transplant procedure. For a successful and natural looking hair transplantation result, the hairline design should be natural and compatible with the patient’s facial shape and appearance. This requires experience and an aesthetic understanding. The starting point of an operation is the medical examination. At this stage, it is important to understand the patient in order to conduct a needs analysis and develop a good operation plan. At Dr. Serkan Aygın Clinic we always act in accordance with these principles. For individuals experiencing hair loss, a hair transplant may also be in need of other sources. As an example, if the donor hair, which takes place at the back of head, are not sufficient to cover all areas of baldness, the chance of a successful hair transplant is unlikely. For this reason, to be able to perform a more successful hair transplant operation, grafts from different parts of the patient’s body can also be used. Hair transplant using beard grafts, is generally performed in cases where the patient has inadequate scalp donor supply and when the bald patches are too wide to be covered. Beard grafts remain in the growth (anagen) phase for long periods and after the back of the scalp, are an excellent alternative donor source for hair transplantation. Beard grafts are known to be thicker than the grafts at the back of the head. For this reason, to provide better volume in the transplanted area, hair grafts extracted from the beard are transplanted in the top and crown area, but it may not be the best option for front hair restoration. For men planning on undergoing a hair transplant, body hair is considered as a third source of grafts recipient. If grafts extracted from the back of the head, then the beard area are still not sufficient for coverage, among other options, chest hair can be considered as a good alternative source of hair follicles in hair transplantation. There are 2 underlying reasons why body hair is considered as the 3'rd additional donor source in hair transplantation. The first reason is; body hair grafts, particularly chest hair, have a similar structure as beard grafts; they are thick and contain one or two hairs. As for the second reason; as the anagen phase of body hair is much shorter; body hair grows shorter. This being said; hair grafts obtained from the chest cannot be used in front hair restoration.